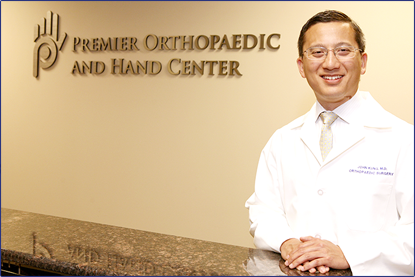 Dr. Kung is an orthopedic surgeon who specializes in hand surgery. He also has extensive experience in work injuries affecting the hand and upper extremity. He is a graduate of Georgetown University Medical School in Washington, D.C. He then completed his Orthopaedic Surgery Residency at State University of New York in Brooklyn, New York and subsequently served in the United States Air Force as an orthopaedic surgeon for four years. After his military service he completed a subspecialty training Fellowship in Hand Surgery at Baylor College of Medicine in Houston, Texas. He is board certified in Orthopaedic Surgery with a Certification of added Qualification in Hand Surgery. He has been in private practice since 2004 in the Chicagoland South Suburbs. His approach to treatment is centered around having his patients return to their normal activities and lifestyle as quickly as possible using the most conservative and minimally invasive treatments available, using surgery as a last resort only after non-surgical treatment options are exhausted. Dr Kung’s offices are located in Flossmoor and Bourbonnais, Illinois.